The well-documented use of tourniquets on the battlefields of Operation Enduring Freedom (OEF) and Operation Iraqi Freedom (OIF) has saved countless lives, and their use has increased in popularity in recent years especially within the firearm and first responder communities. Anyone who has the foresight to put together a medical bag for any reason probably has a tourniquet or two. And for good reason. Tourniquets save lives. They’re easy to apply and with a very small amount of training, can help anyone to save a life. There are few items as simple, but dramatically important as the tourniquet. I learned this lesson during my time as a FMF Corpsman attached to 11th Marines in Afghanistan. And I've used my share of tourniquets and then some in combat, so trust me when I say I'm a fan. 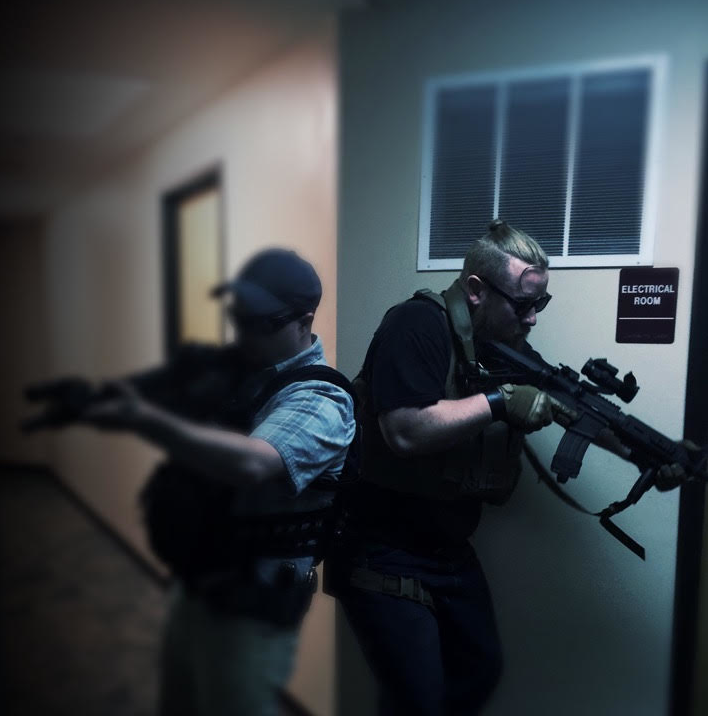 However, the wounding patterns of casualties in active shooter incidents (ASI) show there are some important distinctions to be made when considering what equipment is most important, and how to render aid to those who need it. The Profile of Wounding in Civilian Public Mass Shooting Fatalities is a study published in the Journal of Trauma and Acute Care Surgery on February 16, 2016. The study examines 371 wounds from a total number of 139 fatal casualties of 12 separate ASI’s. From this study, we can see that the primary areas of wounding that occurred during an ASI is the head and chest. None of the victims died from extremity hemorrhaging, which means no amount of tourniquets would have aided the casualties survival. What’s going on here? Why is the prolific use of tourniquets effective for the military and not civilian casualties of an ASI? The key is in how the injuries where sustained in the first place. 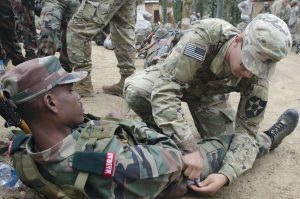 Significant progress has been made in the areas of trauma medicine since Operation Iraqi Freedom (OIF), and Operation Enduring Freedom (OEF), and with it the improvement upon tourniquets themselves and procedures to apply them. The mass use of Improvised Explosive Devices (IED) by enemy fighters, and the use of body armor by US troops, meant a wounding pattern which primarily affected the extremities. This is where treatment with a tourniquet is the ideal solution, and why the numbers backing the use of tourniquets are so high. Granted, it’s not out of the realm of possibility for active shooters to incorporate IEDs into their plans of attack, and in fact there are many cases of crude bombs being found. Overwhelmingly, however, firearms are the weapons used during ASIs against unarmored civilians. Surveillance videos abound of shooters strolling at a leisurely pace taking carefully aimed shots at fleeing civilians. They tend to take their time and move from one place to the next in no great hurry. This ensures increased accuracy, allowing critical hits to be made on areas most likely to cause death – the head and chest. Areas where a tourniquet would have no value. Since the ASI wound study did not consider any of the head wounds survivable, this leaves the injuries of the chest causing all of the preventable deaths. 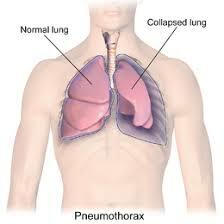 The most common preventable way to die from penetrating trauma to the chest is by Tension Pneumothorax. Tension Pneumothorax develops after a bullet (for our purposes) punctures a lung, allowing air to enter from the wound into the chest cavity, but unable to escape. Over time, air builds up pressure to the point where it begins to restrict blood flow of the heart and other nearby vital arteries. This can cause what is known as Obstructive Shock. The heart and arteries are unable to function properly due to being compressed or obstructed, in a similar fashion to how a tourniquet works. Additionally, pressure is placed on the injured lung making it unable to stay inflated or function. Fortunately, this usually takes a little time to develop as the pressure must build before the Tension Pneumothorax is able to cause complications. Generally around 15-20 minutes, but this is largely dependent on the size of the hole. This length of time means it is not nearly as pressing to address as, say, massive hemorrhaging from a femoral artery. Because of this, the risk of death occurring under normal circumstances is relatively low if the patient is able to get to a trauma surgeon in a timely manner. America enjoys the advanced technology of modern ambulances which are able to quickly drive or fly the victim to surgery to be performed by highly skilled doctors. An ASI is anything but normal, however, and victims could be in place for long periods of time before they are discovered, and/or the scene is made safe enough for medics to do their jobs. This could allow enough time to pass for a tension pneumothorax to kill the patient. The year after The Profile of Wounding in Civilian Public Mass Shooting Fatalities was published, the Las Vegas mass shooting occurred, earning the title of the deadliest mass shooting in US history. The Huffington Post contracted, “Arthur Alphin, a ballistics expert who specializes in the forensics of gunshot wounds,” to give his opinion on the wounding patterns of the Vegas victims as reported by the Clark County Coroner. According to Huffington Post, of the 58 victims shot by the gunman 22 received fatal wounds to the head or neck, 34 had fatal wounds to the chest, and 3 had injuries to an extremity. “The bullet enters the victim’s right leg at the side of the knee, exiting slightly higher on the back of her right leg. The victim’s body is received with a tourniquet, suggesting a bystander attempted to stop the bleeding. (Improvised tourniquets, while certainly better then nothing, are seldom trust worthy. Additionally, the report states: “Contusions and abrasions to the victim’s face, arms and legs suggest she may have been dragged or trampled after collapsing.” If the tourniquet was first applied and then the victim was dragged or trampled, it may have inadvertently loosened. The success of tourniquets in combat is due in large part to the use of modern body armor. Protecting the easiest to hit target on your body (the chest and torso) drastically improves survivability from GSWs. But Active Shooter Incidents are not combat. The people being wounded are soft, slow-moving targets. And as the evidence seems to imply, tourniquets are not the most important medical intervention to procure. The solution is more chest seals. A chest seal is what is called an “occlusive dressing.” ‘To occlude' means ‘to stop, close up or obstruct an opening.' It refers to any non-porous material (plastic) affixed in place to prevent more air from entering the chest cavity. While there are of course many professionally manufactured chest seals designed to function as required, occlusive dressings can be made from just about any plastic packaging or bag, and tape. This ability to improvise could prove handy when/if resources begin to run low. But professionally made chest seals are ideal for expedient treatment. After discovering a penetrating wound on the trunk of a patient, “From belly button to collar bone,” the giver of first aid immediately clamps a hand over the wound site to prevent additional air from entering into the chest cavity. Using their teeth and other hand, or instructing a bystander to do it, the first responder removes the chest seal packaging. The first responder then tells the patient to take a deep breath and exhale. At the end of the exhalation, any blood present on the skin is wiped away and then the sticky side of the chest seal is applied over the wound, ensuring adhesion. The patient is then placed in the sitting position, or on their affected side (recovery position). While a sucking chest wound could eventually kill your patient, I would not consider this a care under fire procedure. The first and primary goal of any armed first responder should be to stop the threat. If it is not stopped, the threat will continue to make casualties faster then you can treat them. The best battlefield medicine is fire superiority. Many trauma, or “blow out” bags, include a needle decompression kit for treating patients with Tension Pneumothorax. This is only necessary after the condition has worsened to the point where it has become life-threatening. The timely and correct application of a chest seal could prevent the need for needle decompression. However, if you decide to carry one in your kit you should be professionally trained and without a doubt understand fully and comfortably how to use it. 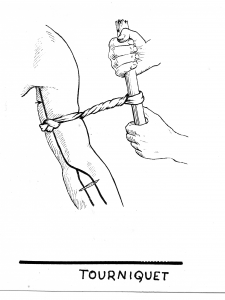 Improper use could cause significant additional injury to your patient. Chest seals on the other hand have no risk as it is essentially just a sticky piece of rubber and is far less likely to cause further harm to the patient regardless of the placement. For someone who is putting together an ASI trauma bag, such as for a faith-based organization, extra chest seals are recommended. I suggest aiming for a set number of patients to be treated and acquiring enough supplies to treat them. From the study we can see that each victim was shot an average of 2.7 times. If we round this number up to three for the sake of discussion, this means there is a total need of 6 chest seals per patient. One for each entry and potential exit wound. If the goal is to be able to treat 10 patients with the trauma bag, there must be at least 60 chest seals in addition to all other medical equipment. This might seem like a lot of chest seals for just 10 people but hopefully you won't have to use them all, and the relative inexpensiveness of chest seals makes it possible. Don’t get me wrong. Tourniquets are great for saving lives and no medical kit is complete without at least one. However, it's important to distinguish the difference between the battlefield and a crowded concert venue so that better training, mindset, and gear can be disseminated among first responders of Active Shooter Incidents. Check out these medical supplies, next. 28 Responses to Active Shooter Medicine: Are Tourniquets as Important as Everyone Thinks? There is a National Movement called “Stop the Bleed” Campaign—I’ve been trained in it, and the emphasis is truly on Tourniquet use; SWAT, CAT-7’s, Israeli Bandage—all meant for hemoraging extremities. The driver for this movement was/is, civilian shootings (I’m from Chicago so its real)…They also teach how to “plug a wound” with compressed gauze, where a tourniquet can’t be used, but not ONE SECOND or mention of “sucking chest wounds” and how to seal and treat….Be curious to know who, at the National Level is advising or designing the Training for the Stop the Bleed Campaign, leaving out entirely what you are saying in this article about what seems tantamount to survival for civilian shootings. Thank you for sharing—I am now going to add something in my personal IFAK that gets me prepared for sucking chest wound situations. I agree that key “Stop The Bleed” procedures (tourniquet and wound packing) are quite important skills to have in your toolkit. Regarding chest seals, In recent years, procedures for sealing open chest injuries have been removed from first aid level training programs because they run the risk of turning a serious problem (open pneumothorax) into a life threatening problem (tension pneumothorax). Anyone who chooses to carry a chest seal device should learn the signs and symptoms of a tension pneumothorax because if this condition develops after application of the device, it needs to be removed immediately. That’s why Co-TCCC recommends vented chest seals. Most manufacturers of chest seals offer vented versions, and that is why you should purchase if adding them to your IFAK. “Like”… and agree. I’m re-emphasizing the application of chest seals in our tac med training. Thanks. This was a very interesting article. Looks like I will get a few more chest seals. This article is very well written and fact-based studies orientated. As an USCCA Emergency First Aid Fundamentals Instructor and an ASHI BLS & ALS Instructor trainer, I will be amending my training curriculum to include some of the quoted information. GREAT piece of work!!! Probably the best article I have read on concealedcarry and completely based on very reliable statistical studies. I have been trained in first aid and I think a tourniquet is a must have, or maybe a couple of them in your first aid kit, because you never know the situation you might come up upon. Thank you very much for this article. I have wondered often what to do when I was to be confronted with having to provide first aid to someone. The tourniquets I have in my car kit are made of surgical rubber hose about 3/8 ” which actually will stay “knotted” fairly easy. I am going to check to purchase the ones shown in your article. Also thanks for showing the blow out kits. I read about these but did not know exactly what they look like. I will have to get a few of those too for my kit. Hi Neal, glad the article helps. So please, if you plan on carrying one, get trained by professionals on how. And yes, I do recommend upgrading to a more modern style tourniquet. While I have no doubt that the rubber tubing could work if it’s all you have, the CAT or SOF-T tourniquets will preform far more consistently. Yes, they are more expensive then rubber tubing at around $30 per tourniquet. But I know my life is easily worth $30 to me. Especially when I know I might be doing something risky, like get in a gun fight. But don’t forget that knowledge is a weightless tool and will serve you better then all the gear you can carry. Get training and stay trained. Hoorah Senior Chief. Keep those med bags stocked. We believe more and more people are thinking about these things and it’s our goal to shed more light as often as possible. Thank you for commenting. But how many victims survived these incidents because of proper control of bleeding. Without that data this study doesnt tell us much. Dudley, please read my reply to Mr. Lines. It explains why that information is difficult to obtain. However I will say that you are missing the point of the study. The study was to determine how many victims could have survived and how they might have been saved. Researchers were not studying who did or did not survive. The study suggests that many of those who could have survived, would have benefited more from a chest seal then from a tourniquet. While I agree that this study doesn’t tell us everything, I strongly disagree that it doesn’t tell us much. So many variables it’s an “unknowable” and unquantifiable. The best you could come up with are estimates. A great article, driving home the need for an often overlooked item to be added to first aid kits. However, the article draws a potentially incorrect conclusion about military versus civilian uses of tourniquets based on the quoted study. Please note that the study “examines 371 wounds from a total number of 139 FATAL casualties” and that “Only 7% of victims had potentially survivable wounds.” It would appear from that information that very few would have been saved even given the availability of chest seals, although clearly some could have been. No information is included as to how many surviving civilian victims had wounds to the extremities which would have proven fatal had not bystanders applied tourniquets. Any such study should include wounds sustained by all victims, not just those who died, if any conclusions are to be drawn about needed first aid supplies. Studying only those who died gives us no information about which methods of treatment kept those with potentially fatal wounds alive. First is that only 7% would have been saved had chest seals been available. I agree, this number is sadly low. However, it is important to understand that 7% of the 58 victims killed in the 2017 Las Vegas shooting is still 4 people (4.06 to be exact.) 4 people could have potentially survived if chest seals where more available and citizens were trained on how to use them. And while 4 out of 58 isn’t much, it would have mattered to those 4 people, and their families. Your second issue appears to be that the study did not include information about those who survived the shootings, which is important to understanding ASIs wounding patterns. I agree. That information would be good to have. Regrettably, however, that information isn’t there to be studied. Communication between the many different governmental agencies involved with an ASI means that information is slow to get around if it does at all. And any information about the wounding patterns is unfortunately scarce. If you read the study (link provided in the article) you will see that the researchers mentioned how difficult it was to obtain the information that they did, with a good number of Medical Examiners either failing to respond even after 3 attempts were made to acquire the data, or flat out refused, citing state or local restrictions, or lack of man power to collect and collate the requested information. The study goes on to say that even when the researchers were sent data by some Medical Examiners who performed the autopsies, the data was limited. And in one case, autopsies were not even performed. There must be a clear shift in how this information is stored for easier access to those who are performing the studies and providing important clarity to a national debate. But, more importantly, potentially save lives. There has been an acknowledgement of this issue and it appears as though steps are being made to correct information sharing deficiencies, but we aren’t there yet. And until more studies are completed, we won’t get a clear understanding of the problems we face with ASI. Great article. The issue of the tourniquet being a panacea in ASI’s was discussed in an article by Jake Jackson at Tier Three Tactical last year with similar conclusions. Chest seals, like tourniquets are tools in your trauma kit. Having the tool and knowing how to use it, or improvise, are essential skills. The proposition that using more chest seals to save more lives assumes that penetrating chest injuries do not result in a fatal terminal injury to the heart or major vessels in the chest. As a third step in evaluation, the presence of a penetrating chest injury that may be survivable will be evident. The chart of fatalities from the Las Vegas shooting identifies 21 chest wounds. Fatal shots to the back might also qualify as intrusion into the plural space. But these statistics don’t help to determine if more chest seal usage would be effective in decreasing mortality rates. What would be helpful is the number of non-fatal chest/back wounds sustained where application of a chest seal would be beneficial prior to in hospital treatment. Unfortunately, those statistics are not readily available. But if we want to make the case for putting more chest seals in our trauma kits, and justify the cost to benefit, then we need the statistics that would justify doing so. In the Nam we used vines out in the bush and they worked!!!!! I see a lot of Stop the Bleed courses offered and I am going to take a class. I can see how they would steer away from chest seal training, with the dangers you described. I have non venting chest seals in my first aid kits, but will be ordering some vented ones. I don’t want to watch someone bleed out in front of me and be thinking. Man, I wish I had the tools and training to keep them alive until real help shows up. I’m just a guy who has a basic bleeding kit in his car, his work vehicle and at his desk. I have gloves, tape, clotting sponges, chest seal, tourniquets, etc. and rough idea of how to use them. What kind of training would you recommend for the basic civilian, non EMT person? Hi Walt, thank you for your comment, I recommend checking out the Red Cross. They are a large organization and it’s generally easy to find a Red Cross certified instructor for Basic First Aid in your area. However, if you carry a weapon for self defense, I have to say nothing beats a class given by a competent tactical medicine company. One of my personal favorites is Kerry Davis over at Dark Angel Medical. These instructors are in high demand and tend to travel frequently, so you may have to wait until they come to a training venue in a city near you. But the skills and tactics learned there could be critical and well worth the wait. Beyond a Stop the Bleed course I would recommend a TECC First Care Provider course. Check out course offerings for your state at http://www.naemt.org. Dark Angel Medical and Lonestar Medics offer great courses and are highly recommended. Check training groups in your area to see if they offer GSW first aid courses. Good luck. Very good article. I keep 10 chest seals and a roll of gorilla tape in my crash bag just in case as well as 10 Israeli compression bandages. Even plastic wrap, a ziploc bag or trash bag and tape can be used to seal a chest wound so if you ever find yourself in such an emergency don’t be afraid to improvise. If you are going to improvise a chest seal with tape and plastic (ziploc, etc), it is vital you leave one side (dependent) open to allow the air/blood from the pleural space to vent on inhalation. Otherwise, you risk creating, or exacerbating, the tension pneumothorax you’re trying to prevent.